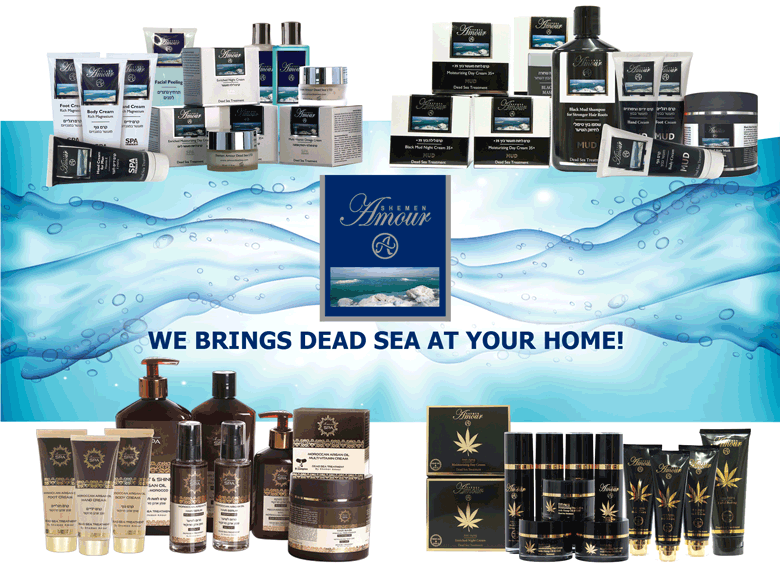 dead Sea Products shemen Amour - Dead Sea at Your Home! Shemen Amour - Dead Sea Treatment - Dead Sea At Your home! The Dead Sea, the lowest place in the world, known in remarkable healing properties, and people from all over the world travel to the Dead Sea for Recovery needs, Spa treatment, cosmetic treatment, and rest. Many Cosmetic companies tied to discover the remarkable ingredients which are hidden in the minerals, salts and mud, but only a few of them managed to solve the secret of ingredients, which bring the best to the skin. Shemen Amour, the brand of qualitative Dead Sea products, best cellers in all over the world, offer to you the best healing and cosmetic properties of the Dead Sea, at your home. All our products were developed to your exact needs, after many research and tests. Combination of gifts from nature and advanced technology. We in "Shemen Amour" believe in 3 principles: a qualitative product, courteous service, and good price. Our aim: to bring to your home the Dead Sea affects. The facial cream is a special combinetion between the dead sea's minerals and Fruits extracts. 27 Mineral absorb immidiately to your facial skin. Your face got the best! ♦ Many Teens find themselves deal with the Acne, especally in the time the appearance is very important to them. worng treatment in that age might leaves scars forever. Shemen Amour suggest to them the solid soaps: Acne soap, black mud soap and act. A dedicated soaps which dry the acne and prevent its appearance. ♦ The foot don't have to seem bad. The end to the dryness, cracking, roughness will come by using the foot cream. For better results use the black mud foot cream. It has, in addition, the mud which has grate effects on the skin. ♦ Your face needs a visit to a beautician, but you don't have time for that. Our products will affect as a cosmetic treatment. Facial scrub, treatment mask, anti aging-peeling mask - give to your face a deep cosmetic treatment including: Cleaning pores, removing dead skin cells, renewing and refreshing the skin and stimulating blood flow. Hair loss has an answer: Black Mud Shampoo for stronger hair roots. Read more...! Dry Hair has an answer: Moist & Shine with Aragan Oil. Read More....! When it comes to your skin - Don't settle! gives body & face the best!